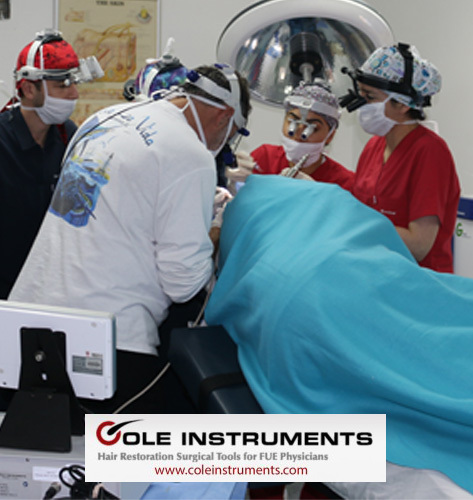 Hair transplant physicians, doctors and hair surgeons have the opportunity, exclusively offered by Cole Instruments and Dr. John Peter Cole, to attend training and observational opportunities with Dr. John P. Cole. An internationally renowned surgeon and creator of specially developed instruments, Dr. Cole has practice exclusively on hair transplant surgery since 1990. Dr Cole, who has been a featured speaker at medical seminars and presentations, now conducts these unique programs. Interested physicians may participate in the programs by Dr. Cole at the Atlanta, Georgia clinic in the United States or at the Hair Transplant Center in Ankara, Turkey, which was established together with the Hairline Clinic in Ankara and the owner Andreas Krämer of the independent online counseling center for hair transplantation Hairforlife.info. Dr. Cole, known well known for his expertise In Follicular Extraction Unit (or “FUE”) and other hair transplant surgeries, demonstrates his proven techniques as well as his specially crafted instruments. Dr. Coles’ proprietary “Cole Isolation Technique” (CIT®), the most expeditious extraction method with the lowest rate of graft damage and the Powered Cole Isolation Device (or “PCID”) with all the PCID Advantages are highlighted in the presentations. These innovations are the product of Dr. Cole’s extensive research and experience in the field. In addition to exploring the latest of his innovative instruments, Dr. Cole shows design, hairline placement and other effective methods and techniques to participants. Read more about the HTTC Training Center in Ankara Turkey on https://www.hairforlife.info/en/hair-transplant-surgery-training-fue-workshop-ankara-turkey/ or on the Website: https://www.hairtransplant-trainingcenter.com. The Ankara Training and workshop includes not only the latest techniques in FUE but also demonstrates the most effective use of CII’s state of the art instruments and supplies. Hair transplant doctors who have taken advantage of this educational opportunity have provided extremely positive feedback. The “Total Solutions Kit” includes a full day of training and observation of Dr. Cole performing procedures and features a package of over $3,000 of products from CII for each participant. Doctors from numerous countries have come to the clinic for this opportunity. Dr. Cole is committed to providing this useful information about his methods and superior results. Cole instruments continues to lead the field in products and training opportunities.